As the English title may have tipped you off to, this TV special is focused on Bardock… who is the father of Goku. Of course, that means he was a no-good dirty Saiyan, and, sure enough, he and his team start the special off by wiping out the native population of an entire planet, getting it ready for re-sale by Frieza and his force. Nice… Bardock is suddenly struck by one of the natives and given the ability to see the future as a curse, and, sure enough, the rough Saiyan foresees Planet Vegeta being wiped out by Frieza, and so begins a journey to prevent the – sadly for him – inevitable. It’s probably not a spoiler to say he is unsuccessful, given… well, Goku and Vegeta being the last Saiyans is a plot point from pretty much the beginning of Z, and so despite everything he tries, Bardock fails and dies with his planet, his only consolation is seeing his son, who was sent off to Earth in a pod just moments before, facing off with Frieza in the distant future. It’s pretty grim, certainly more so than most Dragon Ball-related things. Even Toriyama is quoted as saying “I really like the story of Bardock, Goku’s father. It’s quite dramatic, and the kind of story “I absolutely wouldn’t draw” if it were me. It was like watching a different kind of Dragon Ball in a good way, so I thought it was nice.” So definitely un-Dragon Ball-y, but still good. That’s a valid description… though if you want grim, then stay tuned for Special #2! The History of Trunks (known in Japan as “Defiance in the Face of Despair!! The Remaining Super-Warriors: Gohan and Trunks”) originally aired on February 24th 1993, in between the opening two episodes of the Cell Games (so quite a while after Trunks’ backstory was technically relevant…) Unlike the Bardock special, this was actually based on a Special chapter Toriyama drew, though the Special chapter was very short so the TV Special expands on a lot of themes and characters. Once again, as the English title suggests, this is the history of Trunks, specifically Future Trunks (just in case that somehow wasn’t obvious) and how he grew up in a post-apocalyptic hell full of death and constant fear of Android attacks. As the opening to the special shows, this is the timeline where Goku died of a heart virus and Dr. Gero’s Androids 17 and 18 have since killed everyone we knew and held dear, apart from Gohan, Bulma and young Trunks. 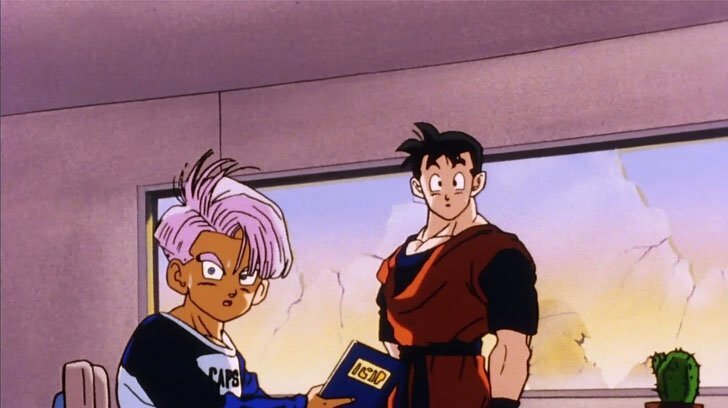 We fast forward to when Trunks is a teenager who looks up to Gohan, now an adult, as they try to train each other to take on the evil creations. As you’d know if you watched the TV series, this doesn’t go according to plan, and in fact there is a rather unpleasant scene where Gohan is seriously injured in a way that, well, let’s just say is uncharacteristically gruesome (though the end result was present in Toriyama’s original chapter, so they were just following what they saw!) He still helps train Trunks, but as mentioned by the time traveller in the series, the Androids eventually “get him too”. It’s a really downbeat experience, but full of some great fight scenes! It ends with Trunks popping off in the time machine, linking into his first appearance in the TV show. As with a lot of back-stories in long-running shows, it doesn’t have any big revelations, instead it’s an interesting look at what he went through before his first appearance. I have to now mention that the picture quality is less on this set compared to the previous six. It makes sense; the films were made on, well, film, which could be nicely upscaled, where as these are just double-length TV episodes, so it can’t be helped. What could be helped, however, is the fact that, I guess in order to keep it in line with the rest of the “Double Features”, it’s cropped and zoomed in to make it 16:9, despite the fact that, as TV specials from the 90s, it was animated in 4:3. I believe the best estimation is that you lose about 20% of the picture for the sake of not having black borders on the left and right of your screen, which is frankly just annoying. Nothing new on the extras front, by the way, just some trailers and the options of English, English with the Japanese score, and Japanese with English subtitles. So the “TV Specials Double Feature” may be frustrating from a technical standpoint, but from a story one it’s a rare glimpse into a Dragon Ball Z without Toriyama’s sense of humour and light-hearted touches. It’s a man fighting against the genocide of his people, and a teen who has to grow up in a death-filled hellish future which gets so bad that his only hope is to travel to the past… It’s grim, but good storytelling and both have some properly great fight scenes in them. So cropped picture aside, this is a Double Feature that even people who dislike Dragon Ball Z can find some interest in, and those who already love the show can have two bits of backstory added to the lore in exciting fashion. Win-win, I say!